Starting tomorrow, Quaker will start pumping out Facebook, Instagram and Pinterest posts with oat recipes, including muffins, cookies and oatmeal. Then on Sunday, Quaker is running its first Instagram Marquee—the social app's year-old takeover ads that let brands hit large audiences in a short period of time. There is also a Tumblr and webpage launching this weekend and a series of sponsored videos with food publisher Tastemade that will roll out on Snapchat, Facebook and Pinterest later this month. All told, Quaker's campaign will include 31 different recipes for the month of October. 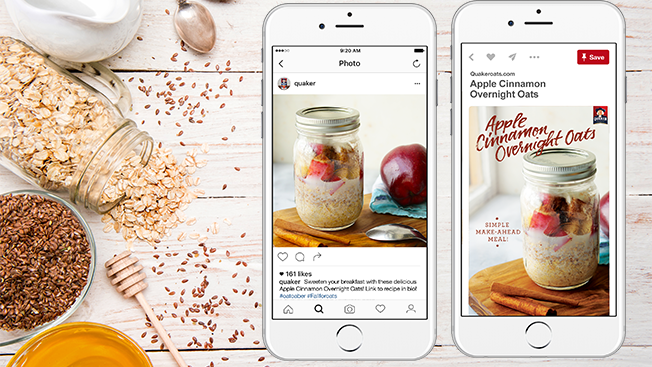 "Oatober is a digitally-focused campaign because the digital and social space is where people connect with food and share their experiences," said Becky Frankiewicz, svp and gm of Quaker Foods North America. "Food trends online have inspired some of our marketing campaigns, such as overnight oats. You can also find many oat-based recipes on Quakeroats.com." The campaign also includes a big media buy with The New York Times. On Sunday, the brand will run a full-page ad in the newspaper and start an online campaign within the cooking section of the site.